We kicked off Plug’n Drive’s online campaign in our Clean50 Special Report in November in the Globe and Mail, for which Up Marketing’s creative team developed editorial to dispel EV myths, promote awareness of the EV value proposition and support Plug’n Drive’s Home Charger sales. Animated digital ads were developed to run on the Globe’s site with the online Clean50 Report material and drive traffic to Plug’n Drive’s website throughout December. Our Clean50 editorial on the Globe’s site was then linked directly into the Google Search campaign, where it continues to get exposure today. 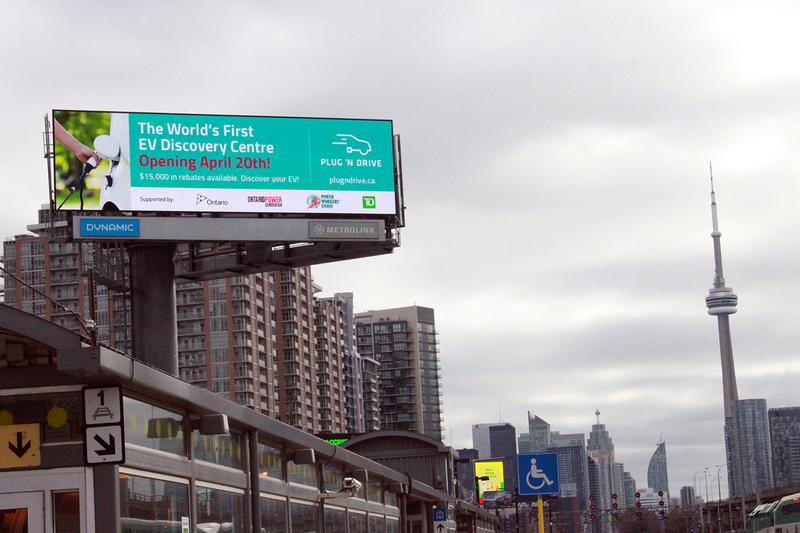 In January, we began planning the transition from the promotion of Plug’n Drive as as our best EV information resource to the introduction of the world’s first Electric Vehicle Discovery Centre. Our campaign drove traffic to Plug’n Drive’s installation at the Canadian Auto Show’s inaugural Electric Avenue and to the Green Car Test Drive at the Green Living Show. Dynamic Search ads inviting auto-shoppers to compare EVs with non-EV options performed exceptionally well along with ads based on other key message points. To support the announcement of the Centre, we produced HTML5 ads to run on news and automotive websites in a Google Display campaign geo-targeted based on Plug’n Drives survey results and bidding tactics related to the searchers’s distance from the Centre. We introduced Centre specific ads and call-outs to our Google Search campaign while maintaining a communications focus on Plug’n Drive as the best source of information about the 15,000 in government rebates. In the weeks before opening, we placed a pre-announcement of the Centre’s launch on digital super-boards on high volume GTA driving routes such as the Gardiner Expressway and in high traffic locations near the Centre’s location, switching ad copy to “Now Open” in April. The grand opening in April was led by the minister of Environment and Climate Change supported by a panel that include the heads of Ontario Power Generation, The Power Workers Union, Toronto Hydro and The Electrical Safety Authority. The showroom was packed to capacity and press coverage was excellent, which will be amplified through links in our Google Search campaign.